It's a non rotating lead head made to form fit a garfish and swim upside down . So far only a single mold has been made for proof of conecept ' and a handfull of heads are being put up against other type of heads in commercial fishing operations. Early results show the Buffalo Head has clear advantages over normal upright towing rigs ... espeacially when fish are thin on the ground . No need to rotate the head to set your skirt patterns ' once you design and wire your skirt patterns to the head that is it ' so all your colours stay right where you want them . You can skirt them with large plastic skirts . Looks like an easy to use trolling head compared to other garfish trolling heads. I can see it has done away with the bait or nose spring, but other than the presure of the tow what holds it to the garr in the event that there are more than 1 bait out the back,and the boat is stoped to fight a fish. If the remaining baits are left out the back and not wound in, will the nose weight slide forward along the trace ( wire or mono ) and then refit itself when the boat is again in motion or do they need to be wound in each time the boat may be stoped. A common rig with the spring, especialy single strand wire will pin the mouth closed and the spring to the fish alowing both bean sinker and skirt to slide back into place. Current tests are being conducted commercially ' they don't stop to haul lines ' they haul and tow and if a fish hits multiple line they simple keep the lines tight and loaded up ... never do they stop to retrieve. Keep in mind they are also using 200 to 300 pound main line and using high speed electric winches . So under these conditions the Buffalo Heads are working well ' the gar is staying put on the wog line and staying put on the head during slow speed tight turns to get the bait to drop deep over structure . Where is has never been tested yet is during Stop ' Drop and Go runs .... this is when you stop your boat over deep sitting fish and let the bait dead drop and then before hitting the bottom you apply the power and shoot the bait to the surface . But i can't see why the inserted gar head can't be pinned into the head for other types of applications . Forgot to mention that the Buffalo Head has four sides unlike a bullet head that is evenly weighted all way round . It can't tow on it't left of right side and it can't tow in any other oreintation other than upside down . And even if the gar itself does spin it could not for long as the head of the gar would locate itself to the head and only a vertical position of either belly up or down . Sea trials of the Buffalo Head has just been completed . For this two commercial mackerel boats participated . Both boats worked in the same area together over a 12 days . The first Boat used standard type trolling heads '' 50 gram bullet heads '' and the second boat used only the 100 gram Buffalo Heads . 198 Spanish Mackerel where caught on the 50 gram bullets heads . 281 Spanish Mackerel where caught on the 100 grams Buffalo Heads . 1. The Buffalo Head was 50 grams heavier than the 50 gram bullet heads . 2. The Buffalo Head does tow deeper than the 50 gram bullet heads . 3. The Buffalo Head does tow upside down . This is one of those things where the Makerel where deeper so the Buffalo Head was able to take the top spot over the 12 days . A 100 gram bullet shape possibly could have done the same job ' however the Bufalo Head still tows upside down which does make the gar a stand out to Macks. The Buffalo Head was slightly slower to deploy than a standard bullet shape head ... only for the reasons of making sure the head of the gar was engaged properly into the Buffalo Head and making sure the eye of the hook was set properly to the eye of the gar . For the operator is was more of a trying to forget using the standard style of the bullet shape heads and thinking more about what the Buffalo Head is designed to do ..tow upside down . Interesting, but maybe one fisherman was better then the other? Maybe if they swapped around, that would be even more interesting. Yes this is true ' one of the fisherman was a 35 year vetran and he also had a deckhand ( his wife ) helping him haul the fish in . This bloke is also conciderd to be one of the top catching commercial operators in North Queensland and very well known in the Industry . The other bloke well what can i say 'not that well known' he is a full time employed drill rig operator . but to give him some credit he did have maybe 10 or so years experiance trolling commerially but he left the game to go drilling . He does when the chance presents itself do a little bit of moon lighting and on this occasion he poured the Buffalo Heads and was the operator using them who caught the most fish . 1. the fish where simply running deeper . 2. the upside down gar triggers a better bite response . Instantly you would assume i would choose thought number two 'right ? ....no wrong ... again 50 grams of weight versus 100 grams ' huge differences there so until i make the 100 upright head and trialing them side by side i wont actually know what's going on . I have had plenty of time to think about many things. There is one thing i can say to to all you lure lovers ..
Its not about how fancy or how flash a lure is ' its about what works on any given day . My personal best ever Barra was 117cm ' i have never done better than this ever ... before the days of bag limits i must of caught a dozen fish this one night ( yes at night )all around that meter and over . Applause to you for thinking out of the box and trying something new. That is the only way fishing evolves and all of the spin offs that comes with it . The smarter the fisherman the more he is willing to try new things. I have seen pride get in the way of fishing. Recently I spoke to a bloke with a self confessed "lots of experience" on the wharf who was complaining that he couldn't catch bait on his bait jig. I could see the two things he was doing wrong. I tried to coach him on one of these things and he fobbed me off with "his vast experiences". I didn't even bother to try to tell him that he was using the wrong bait jig. We have found that sometimes the macks will only hit the deeper lures. But many times the deep and the shallow trolled lures equally take the fish. So it would be interesting to see if there is a difference between the upright and the upside down trolled gar. I have seen lures painted "upside down" for your same reasons. My quote on my posts say "you don't havta be pretty to fish". This is meant to be a comment about all those people that look like a million bucks but can't catch a fish - "all the gear but no idea". 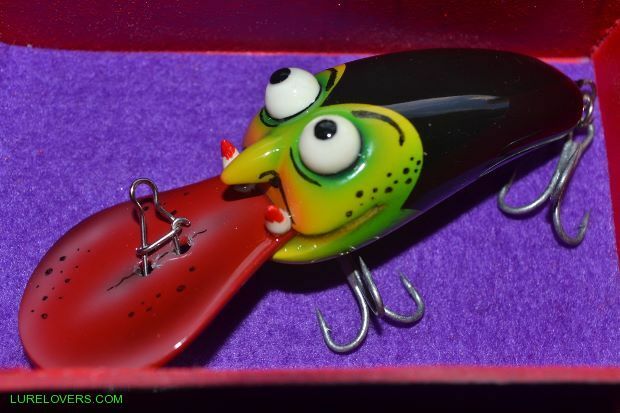 I'll use a lure if it works no matter what it looks like, but I do have a huge preference to the cottage lure industry which is mainly timber and resin moulded lures. My tackle boxes have a lot of very pretty lures, and a hell of a lot of very ordinary looking lures. I give them all a go as I like testing lures made by people that I know. We have all seen that bloke with the old shabby gear totally out fish everybody else, his greatest pieces of fishing equipment is his brain, experience and skill. Smokey bacon no :7? Would love to see a photo thanks. i like your train of thought Buffalo Marine ,the best luremakers are always considering new things (and implementing them),it also makes it much more interesting to try different things. One night many years ago in Townsvillle ' we where parked at the old 5th avenue trawler wharf ... i reckon i would have been all of 17 at that time. I walked right down to the end of the wharf and saw Barra all milling around under the lights , never caught a barra before and i raced back to the boat to grab a line . I never had no flash gear just a handline and a box of mustad 7/0 Kirby which i used to hand line trout in the mornings after trawling all night . There wasn't any bait on the boat as we had unloaded so not even a prawn ' but i did find some bacon rashers in the fridge . So with bacon and hand line in hand i raced back down to where the fish where and loosely thread on a rashers on bacon to the 7/0 kirby ... yep smokey bacon . I gave another two commercial mackerel fishers a chance to trial the Bufflao Heads but they pretty much just snubbed me off and turned there noses up . One of them can catch fish and he is also a top catch boat ' but he just flat out refuse to try any new ideas at all 'unless he come up with it . AND the other bloke is just wonders why he can't catch as well as the others ' one look at his gear and how he does tow lines make you even wonder how he can catch a fish at all .... anyway he took one look at the heads and said to heavy. Let me also add that when macks are jumping they will pretty much chew anything that moves much like the barra on the Smokey Bacon No:7 lol . Those type of people are called dinosaurs, they just haven't realised that they are becoming extinct. I was fast becoming a dinosaur in my job, not that I didn't want to learn the new way, the fact that I couldn't learn it. That's one big reason why I took the early retirement - before it killed me. i'd eat that bacon lure myself! The lads just completed another run. 140 Macks using the a standard bullet head . 210 Macks uisng the Buffalo Head . I still don't have a 100grams standard bullet shape head so on this sea trial they added a little extra weight to the line ' which is a normal common pratice among them to get the lines a little deeper . And given that the Buffalo Head is around that 100gram mark no extra weight was added to the lines . Also in this sea trial the Buffalo Heads where used side by side with the standard bullet shape heads from the same boat...but as soon as it was evident that the Buffalo Heads had the mojo the standard head where quickly removed from the other lines ' this annoys me a bit as i would have liked a more side by side conclusive testing . Nether the less i can understand that the lads are out there to make a living and put the meat on the boat. The fisherman using the standard head did this time attempt to use the Buffalo Heads .... he had one Buffalo Head and lost it on the first go ' he was given another and also lost it straight away by this time he had had enough and didn't try again . So far the numbers peak season are looking good for the Buffalo Head ' but im not going to get excited yet until the Buffalo is run beside a standard head of the same weight. As for the fisherman using them ' well he is over the moon ... in a few days he will send me a video of the Buffalo Head in action so that will be good to see. just wish i knew what it is those Macks are seeing ? Is it the upside down gar? Or could it be the way the head moves through the water ? Meaning the shape of the Head could be making some sort of noise ...like the way the Head parts or folds the water as it's being pulled along. Trails of sorts as they disturb the water ' maybe plays with the colour spectrum like a Kaleidoscope . and maybe i reaching and over thinking this just way to much lol . One of those weather proof bicycle cameras on a diving plane attached to the line of a trolled lure can show you some of these answers. A mate used a similar sort of set up to see what was happening behind his tinnie. Yes ' trying to organise something just like that for mid winter next year . Okay so i had some more news come in over the Buffalo Head ' the commercial fisher who was uisng the Buffalo Head and doing very well was not able to get back out as he also has another job . He is up Cooktown ( of all places ) drilling ATM . Any way he rings me to tell me his mate bit the bullet and put on the Buffalo Heads and gave them a proper go ... and yeah he caught and did really well . I don't know the numbers but it looks like old dogs can learn new tricks lol . Horrorhead i see your up that way ? do you chase macks ? yep I chase the mackerel when I can get out. I’m in Brisbane at the moment and will be back up there in a couple of weeks.